I’m back after my holiday hiatus. The humans went away and we had a very nice cat sitter. I must say, at least on behalf of The Tribe of Five that staying at home and having a nice cat sitter come in twice a day is soooo much better than being hauled away to some place to stay in a cage. If you have a great cat sitter, tell us about them. Two paws up for all cat sitters! Now, let’s get to the items I found on my weekly wanderings through the web. No matter how floofy and sweet we felines look, if you look a little deeper, you’ll find many of us have an affinity with rock and roll and metal. The humans behind the Twitter Account, Black Metal Cats understands this very well. I admit I’m a little more rock and roll than I am metal. My theme song would be “Born to Be Wild” but every feline can enjoy a little darkness now and then. Adventure cats are the cat’s meow and I am purrrticularily interested in cats who swim. As you may know, the female human and i are planning on being kayak buddies. Unfortunately, it took us a while to find just the right life jacket (don’t I look handsome?) and then the skies were so filled with smoke from the forest fires that surrounded us that the air quality was not good for humans or animals. So, onward and upward and looking forward to next summer. The female human was very pleased to see the precautions Craig takes with Millie but thankfully, she has not suggested that we add mountain climbing to our summer adventures! You can follow Craig and Millie’s adventures on their Instagram account. Dear Humans, this is a cautionary tale for you, never, EVER underestimate the power of felines and social media. Max, the Orange Tabby first came to fame when he began sneaking into the library at Macalester College. Now what can be so bad about a cat with litter-ary aspirations? Evidently quite a bit according to the librarian , who banned him from the building and even went so far as to create a wanted poster for the door. Max’s plight created a stir on campus. There were cartoons about Max, a student created a library card for Max and there were #FreeMax comments all over campus. When social media picked up the story more people joined the Max bandwagon and an international hue and cry was raised for Max the Library Cat. Things reached the point where the college President arranged a meeting with Max. You can see the video on the page with the story. The sit down was not a great success, with the college President complaining that a cat is more famous than he is. The rest of the meeting was interesting. You must watch the video. Suffice to say, Max had the upper paw! Sheesh, what’s a cat have to do to keep a job? If you follow me Wednesday wanderings you know I love to report on Cat Cafe’s, especially the ones opening up all over this nation. 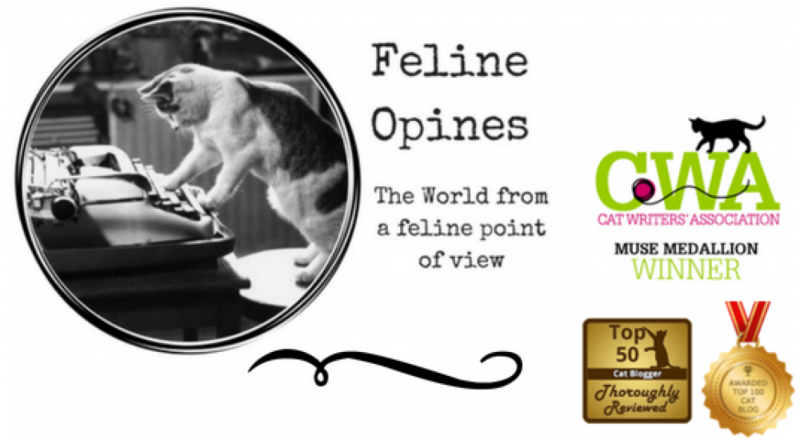 If you think a cat cafe is just a place to see or interact with cats you’ve got another think coming. Take the Kit Tea Cat Cafe for instance, they do lots of neat things there and, aside from their special events, they even make it easy for visitors to understand what the cat cafe experience is. Check out their easy to understand graphic for visitors. You can book any regular visit online and even book the special events like the yoga nights, Happy Meowr, Mewvie Nights, The Caturday Morning Cartoons and more. Follow the Kit Tea Cat Cafe on Instagram. Have mew heard about our Caturday Morning Cartoons event? Come in your best jammies and curl up like a cat (with a cat) to watch an hour of nostalgic 90’s/80’s cartoons and commercial clips on our big screen – surrounded by 10+ sanctuary kitties. A cereal bar filled with sugary sweet cereals will also be available to make it the ultimate Caturday morning! The female human said if we lived close to San Francisco she’d be there! Great job Kit Tea Cat Cafe! See you at the breakfast bowl. This entry was posted in adopting kittens, animal shelters, athlete cats, Cat adoptions, Cat blogs, cat cafes, cats, Cats with jobs, Pet blogging, shelter cats, Walk Through the Web Wednesdays and tagged @evilbmcats, Black Metal Cats, cat climbing prtner, caturday cartoons and bottomless cereal bar at kit tea cafe, i heart cats, KitTea cat cafe, Max the Macalester library cat, Millie the climbing cat, pechanga instagram, Sasha the swimming cat by Feline Opines. Bookmark the permalink. Pingback: Walk Through The Web Wednesday 12/6 - Baptize A Cat? I’m not so sure all of the Tribe would be as willing to take a road trip, although I wouldn’t mind. The life jacket is pawsome! Those cats climbing and swimming are great, but we’re going to stay on the sofa. It’s cold here in Michigan right now. Very cold in the Pacific Northwest too but I’m looking forward to summer days on the lake.